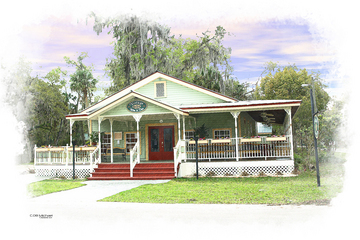 Vintage on 5th is an eclectic, destination restaurant located in the historic downtown area of Crystal River, FL in a renovated church built in 1940. Our goal is simple. Combine excellent service in a unique atmosphere with creative cuisine using fresh ingredients sourced locally whenever possible, complimented by a great selection of fairly priced, food friendly wines. We specialize in fresh fish such as Black Grouper, hand-cut Steaks and exceptional Seafood dishes. We also serve regional Southern favorites like Shrimp & Grits, decadent Mac & Cheese and Fried Green Tomatoes, as well as Pasta Dishes, Rack of Lamb and "Maple-Leaf Farms" Duck Breast. We pour 35 wines by the glass and have a well-rounded wine list with over 140 fairly priced selections. Children welcome/kids menu available. Call ahead to dine inside our beautiful pine-wood dining room or our peaceful outside wrap-around porch and courtyard area. Our friendly staff excels in Southern hospitality and will make your dining experience a memorable one. Please call to make your Reservation. *WE DO NOT ACCEPT RESERVATIONS VIA EMAIL OR FACEBOOK. * Our unique and fun Wine Bar is seated on a first come first serve basis. Our bartenders are the friendliest in town, and will be happy to assist in your wine selections.The Wine Bar offers a special tapas-style menu or full dinner menu including a diverse selection of wines by the glass and specialty beers. *WE GLADLY ACCEPT VISA, MASTERCARD AND CASH. *We do not accept the American Express Card as a form of payment. WE SELL GIFT CERTIFICATES!! The ideal gift for family, co-workers and friends that we make easy! Just stop by or give us a call (352)794-0004 and we can mail directly to you. RECOGNIZED FOR "INEXPENSIVE WINE PRICING"
Dog-Friendly dining is available on our verandah or courtyard area for well-mannered pups.